After making a strong recovery with improvements in the job market made possible by the hard work of President Barack Obama, the economy of the United States has been dipping as of late. The crisis in the Middle East and North Africa has hurt the American economy. Because of tensions overseas, the gas prices in America have skyrocketed as a reaction to the record highs in the price for crude oil. In addition, the cost of food has also been affected due to the price of oil rising, thus hurting the food market in various ways ranging from production to transportation. It also does not help that Republicans and Democrats in the United States Congress spent so long to agree on a budget for the rest of fiscal year 2011 at a time when the national deficit and debt are increasing at unacceptable rates. With the combination of all of these events, the strength of the American dollar has fallen. Not only has it fallen, but it has fallen to a 15 month low in its strength against the euro. 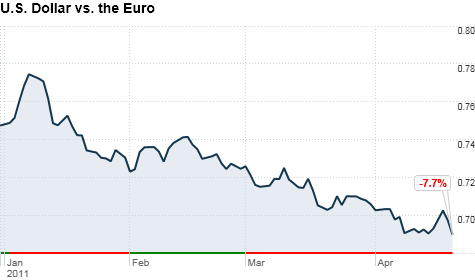 In January, the euro was beating the dollar as it was trading against it as $1.33. Tuesday, the rate ballooned to a staggering $1.45 against the dollar. In addition, in June 2009, the US dollar stood at 87 in the dollar index. However, today, it sits at a low 74, which is also evidence of a five percent drop so far in 2011. In some good news, the dollar still sits at a higher rate than it was at in July of 2008, right before the stock market crash, when it was at the lowest rate against the euro in recorded history. Also, on Tuesday, the Dow Jones did make a solid gain. Gold and Silver also continued their climb to new record numbers. For the time being, the American dollar is safe. But over time, the national debt and deficit might hurt the dollar to the point where a new economic crisis occurs. The fall of the dollar is just one more sign that it is time for Congress to buckle down and figure out how to tackle the issue of the national debt. President Obama has already presented a solid plan to the men and women on Capitol Hill, now it is time for those leaders of America to come together and do something that they have not done in quite some time: work for the best interest of the American people. ¨hard work of President Barack Obama¨. Unless his golf handicap is getting lower………..